On Sunday, August 5th, 2012, owner/driver Chris Fertig and throttleman Tyson Gavin set a new world record of 21 hours and 39 minutes in the "Bermuda Challenge," a 780-mile open-ocean run from New York City to Bermuda. 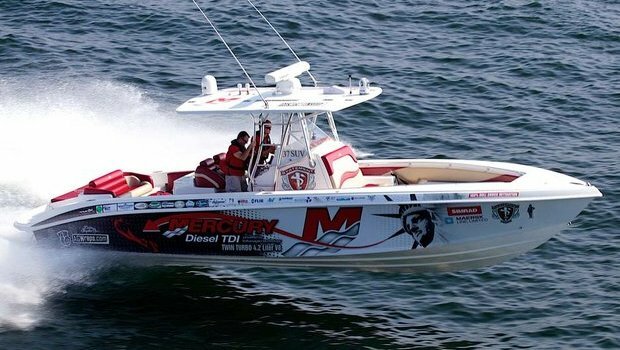 Fertig set the record aboard "Mercury Diesel TDI," a Statement Marine 37' SUV. Fertig and Gavin set out from Liberty Landing Marina in New Jersey, carrying 686 gallons of fuel, and averaged roughly 35 mph during the course of the endurance event, en route to breaking the previous record, set in 2002. This was Fertig's second attempt at the crossing. He previously attempted the run last year, but had to turn back when conditions deteriorated and seas picked up to over 14'. "Conditions were better this year, but it still got a little rough out in the gulfstream," said Fertig. "The swells were running 6' to 8', with the occasional 10-footer mixed in there. This wasn't a run you'd want to make in an ordinary center console. Statement builds an outstanding boat, and our Mercury Diesel TDI engines and our integrated Simrad electronics system worked flawlessly." Congrats to Chris and Tyson on their achievement!